The Boy escapes the oppressive Castle of his birthright on his fourteenth birthday. As he ventures into the unknown, his rebellion leads him on a descent to ancient alchemy and present danger. He must call on his wits to escape - or be trapped forever. 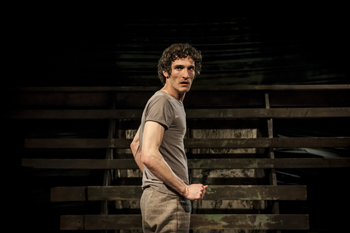 Storytelling and physical theatre intertwine in a bold, new stage interpretation of Mervyn Peake's novella 'Boy in Darkness', performed as a solo show by Gareth Murphy. Capturing a chilling adventure in the teenaged years of Titus Groan, hero of the celebrated Gormenghast trilogy, Boy in Darkness is a gothic fairytale underpinned by Peake's rich and powerful language. The Blue Elephant continues to bring the work of one of the twentieth century's greatest writers to the stage with this original adaptation, following the world stage premieres of Mervyn Peake's plays The Cave and Noah's Ark. Please note that seating for this production is a mixture of sitting on cushions on the floor and on chairs. "Physical theatre and storytelling at its finest"
Charlotte Everett: London Tour Guide, Journo, Adventurer. "Physical eloquence and bold storytelling do justice to Peake’s fantasy realm"
"Murphy is a consummate professional not letting up for a second during his seventy minute performance"
"The performance itself...is nothing less than a tour de force from Gareth Murphy"
"the elegance and economy of movement [was] almost hypnotic to watch"
"Gareth Murphy holds a captivated audience's attention...single handedly for just over an hour"
"But it is extraordinary: a howl, an imperfect and painful philosophical struggle, part of a remarkable artist's testament. Honour to the little theatre."